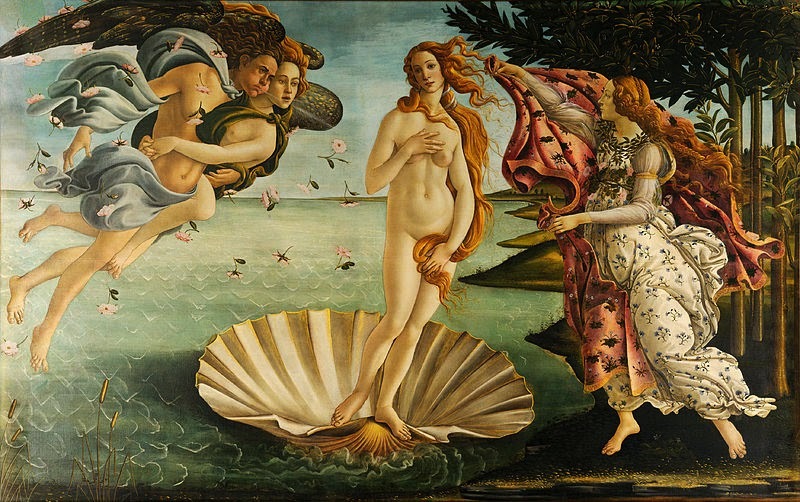 Strangely, the name ‘Botticelli’ had been echoing in my mind relentlessly since a few weeks. There were other painters like him, too who lived in the exact age as he did like Michelangelo and Leonardo Da Vinci. Yet, I keep thinking of this guy, just because I found his love-story unique. 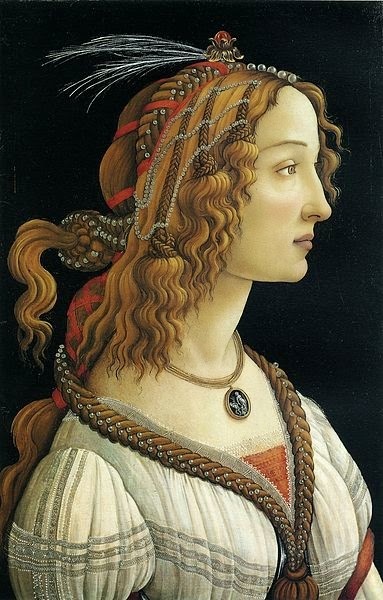 There are many theories about the identity of the beautiful lady in all of his paintings… and the most legit-seeming and romantic answer seems to be… Simonetta Vespucci, ‘The Beauty Queen’ of her age in Florence. She is rumoured to be unrivalled in terms of beauty, but the poor woman died at an early age – at about 22 years old. Sad, isn’t it? Unearthing a five-century-old love story seems exciting enough, and so I see that people want to believe that it’s Simonetta who was in his paintings. Botticelli had also willed himself to be buried along with her upon death – which is evidence enough for many historians that he was in love. This passionate story is something that I could not find in Leonardo’s and Michelangelo’s lives – they’re rumoured to be homosexuals, which is even proved in the case of the latter from his own poems – but the duo were better researchers and liked to exhume corpses and stuff to study the human anatomy in detail. But Botticelli? He looks more like a man of love, to me… he looks like he lived for Simonetta, for, he had never painted any other woman after he had laid his eyes on her. Even after her death, she is seen in numerous paintings of his. She died in 1476, and yet, Botticelli’s works that came much, much later contained her portraits only, when it came to painting a woman. Many historians call it the face of a nymph which Botticelli might have used, but there’s no proof for anything, is there? Sure, Michelangelo seemed to have some woman as his ‘friend’ later in his life who meant a great deal to him, but it didn’t look like they really had an affair or something, though Michelangelo is said to have regretted not kissing her on her face. And Leonardo… man, I wish I could just listen to his brilliant theories and lectures – research was his only wife, and that is pretty much obvious to all of us. Now, one thing that keeps me confused is the question ‘how did all the men of Florence try to get to her when Simonetta was married?’ ‘Was Marco, her rightful husband, really weak?’ And there seems to be no good answers for questions like these… and is left to speculation by the addled minds of the masses. If Marco was really a dedicated husband, he would have never allowed the ‘great fighting tournament whose winner would get Simonetta’ from happening. After all, she was his wife, was she not? No one knows what happened after that. This is when Botticelli comes to my mind. He is never mentioned at all at this point, because, let’s face it: a painter, however romantic he wanted to be, could not afford to fight powerful men. He could only paint a portrait of her and stand undetected in a corner of the crowd. I wonder what he would have felt when the lady of his dreams was ‘won’ by someone else… by someone he knew and respected. Would he have not shown any feelings at all? Alas, news of Botticelli’s every reaction cannot survive the ages, and here I am, thinking of what poor Botticelli would have done that very day. Alessandro Filipepi. Sandro Botticelli. A name so fine. A name of love. A name that bore the title ‘very fine painter of the Italian Renaissance era’ along with two of his peers, Michelangelo and Leonardo. And love made all the difference.